I live in a Civil War era attached rowhouse in historic Charlestown. Although the house has been restored, the basement remains a scary place. Fieldstone walls, old beams, uneven floor and 6 foot ceilings are just part of its dubious charm. I say basement, but it's actually a sub-basement. I live on the slope of Bunker Hill, so you enter the second floor into a double parlor - the back parlor is my studio. Upstairs are the bedrooms, downstairs is the kitchen, dining and family room, all opening to a good sized urban style garden. Below that is the basement, a good 15 feet below street level! So what better place than this dark, creepy place to set up a photography station? 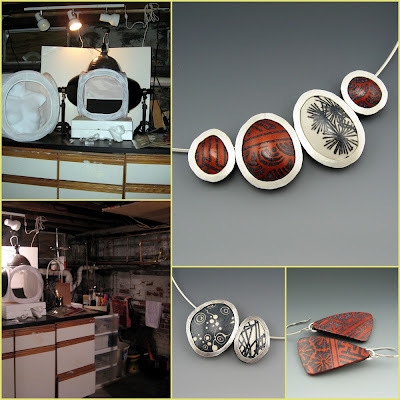 I use two lightboxes - one for jewelry closeups and one to house Curvaceous. Curvaceous is my mannequin and was rescued from the dumpster when the local Curves went out of business. Unfortunately, she has since undergone a rather severe mutilation, having been cut in half with my jig saw to make her fit into the lightbox. But I make it up to her by letting her wear my fab jewelry - much more attractive than those silly purple workout outfits she modeled during her stint at Curves! Anyway, I think my product shots are wicked cool. All thanks to my creepy, dark cellar!